Public intellectual Irshad Manji has a provocative suggestion for her fellow progressives: To heal American divides, stop shaming, she says, and start listening. "You said that labels define who we are and I wouldn't say the word is 'define.' I would say the word is 'distort.' Labels distort who we are very often because they aren't just innocent descriptors of beings. Labels come with baggage and it's often baggage that you, the person being labeled, have not bought into. So, for example, there are plenty of people clear across the country who, depending on their political perspective, will sort of view my label, Muslim, and say, 'Aha. So she's a stealth jihadist.' On the other hand, some will say, 'Aha, she's corrupting Islam because of her other label, gay.' Still, others will say how she's giving cover to the Islamophobes, because now they can say, 'Look, we don't hate minorities. We love this gay Muslim who's critiquing Islam.' So, you know, people ascribe meanings to labels and that's what makes them so dangerous. Factually, the labels may be true, but we are all so much more and often very different than the baggage that accompanies those labels." "It's one thing to be labeled but it's another thing to then use those labels to demean and humiliate. ... If we're now doing the same to straight, white guys, how is payback amounting to any kind of progress?" "The same stale mistakes of the past — to me, it just befuddles me how more of us on the liberal and progressive side of the spectrum are not seeing this. We criticize the early North American colonists for taking individuals and slicing them up into labels, into categories. So, for example, a human being wasn't merely a human being, he or she was black. And then assigning value to those categories, and in that way, the early colonists created a hierarchy of worth. Well, I have to say I think we're doing the same thing now in the name of social justice. And at the bottom of the hierarchy are white, straight men. Now, I realize that that's an inflammatory statement to make, but I have to tell you that it has occurred to me so often — and as the poster child, or somebody who's been treated as a poster child, of multiculturalism, I see this all the time — I'm in this position to see how diversity is being practiced, and it's being practiced as labeling. Somebody like me who is supposedly triply disadvantaged because I come from all of these different minority groups is sort of at the top of the hierarchy of people who deserve to be respected. But cisgender, white men, screw them, goes the attitude, because they've got all the power." "I have to emphasize: It's one thing to be labeled but it's another thing to then use those labels to demean and humiliate. And yes, I realize the irony in what I've said — that has been done to people like me for generations. But as I asked repeatedly in 'Don't Label Me,' if we're now doing the same to straight, white guys, how is payback amounting to any kind of progress? Why is it OK if we do it to others when it was so wrong when they did it to us?" On rejecting diversity of viewpoints — what Manji calls "dishonest diversity"
"It fixates on external markers like complexion and gender and religion when, in reality, even when you belong to any kind of a group, even when you voluntarily affiliate with any kind of a group, you don't stop being an individual within that group. And that's why if diversity is going to live up to its ideal, it has to include diversity of viewpoint. By doing so, we're not compromising our ideals at all as liberals and progressives. We're saying that we're all about inclusion. And if a straight, white guy has a different viewpoint than I do as a queer Muslim, well, you know, he's entitled to because I'm practicing inclusion not exclusion. Now whether that means do I walk away from the from him just because he disagrees with me? Absolutely not. I learn to engage, and in getting to know that person as a human being and as an individual, I can glean information about him or her that then allows me to reframe my own arguments in a way that they can hear me. "There's an iron law of human psychology and it's a very simple one: If you want to be heard. You first have to be willing to hear." "Throw labels onto somebody simply because of the position they hold. But ask yourself, 'What change am I leaving on the table if I walk away prematurely?' "
"I would emphasize potentially harmful. We can't just assume that an opinion is harmful simply because it's been stated. We don't know where that opinion is coming from. We don't know the personal experiences of the person who has that opinion. "In the book, I tell the story of two people, a young hip-hop artist named Genesis, born and raised Muslim, and a somebody who would become her friend, a young white guy named Louis. Genesis wants the Mississippi state flag to be changed because right now it sports slavery-era symbolism, whereas Louis, who is a descendant of a Confederate soldier, wants to it wants it to stay the same. Now you would think that Louis is a racist because he doesn't see the need to change the flag. But Genesis — instead of simply labeling his opinion repugnant — she actually sat down with him and discussed it with him. She started by asking him, 'Louis, how does the flag make you feel?' And he answers and then asks her, 'How does it make you feel?' And over the course of an afternoon he comes to realize something quite surprising: that though he wants the flag to stay as is, he winds up caring more about Genesis than about the flag itself. He has since not just taken down his own Confederate flag, but he has become one of her biggest supporters. "So, again, you know, throw labels onto somebody simply because of the position they hold. But ask yourself, 'What change am I leaving on the table if I walk away prematurely?' 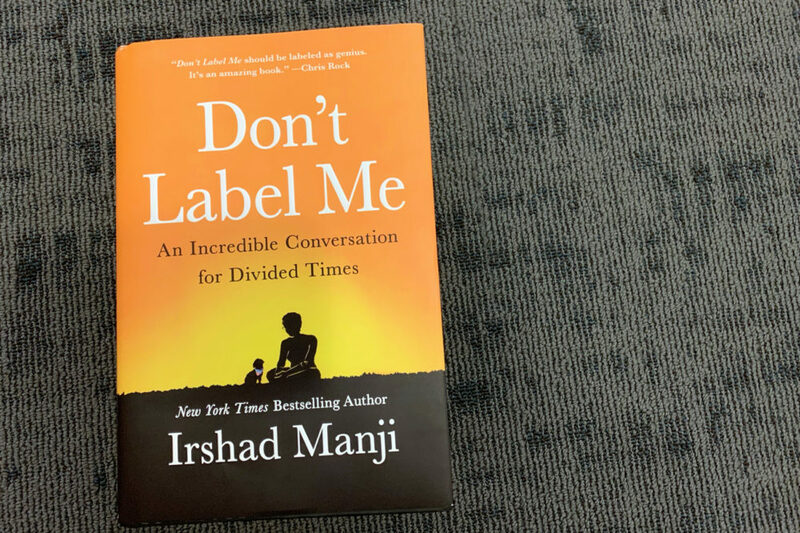 "
Excerpted from DON’T LABEL ME: An Incredible Conversation for Divided Times by Irshad Manji © 2019 by the author reprinted by permission of St. Martin’s Press. Newsweek: "In 'Don't Label Me,' Irshad Manji Has a Radical Prescription for Fellow Progressives: 'Stop Shaming and Start Listening'" — "A white man walks into a bar. Perhaps he’s wearing a 'Make America great again' cap or a Red Sox T-shirt or a crucifix. Maybe he has a tattoo sleeve or a nose ring or a yarmulke. Whatever the signifiers, you consciously, or subconsciously, have decided he is one of Us or one of Them. "A blind and aging rescue dog named Lily—Manji’s 'mentor and tormentor'—offered her a way out. The book is an imaginary conversation between them, resulting in a passionate, playful and persuasive argument for rejecting dishonest diversity—the categorizing that fixates on biology (white, black, male, female, LGBT, straight, etc. )—and its attendant and unforgiving call-out culture 'where asking the wrong question gets you slammed. If derelict systems will ever evolve,' she writes, 'people have to risk giving offense.' "
This program aired on April 10, 2019.